Across the nation on Veterans Day today, Americans are honoring the sacrifices and service of the armed forces. President Barack Obama on Monday paid tribute to those who have served in the nation's military, including one of the nation's oldest veterans, 107-year-old Richard Overton. "This is the life of one American veteran, living proud and strong in the land he helped keep free,'' Obama said during a ceremony at Arlington National Cemetery. Overton was among those in the audience for the outdoor ceremony on a crisp, sun-splashed Veteran's Day. Earlier Monday, Overton and other veterans attended a breakfast at the White House. Obama used his remarks Monday to remind the nation that thousands of service members are still at war in Afghanistan. The war is expected to formally conclude at the end of next year, though the U.S. may keep a small footprint in the country. As the Afghan war comes to a close, Obama said the nation has a responsibility to ensure that the returning troops are the "best cared-for and best respected veterans in the world.'' The country's obligations to those who served "endure long after the battle ends," he said. The District of Columbia honored two of the original Tuskegee Airmen with the Congressional Gold Medal while D.C. Mayor Vincent Gray and congressional delegate Eleanor Holmes Norton laid a wreath at the African American Civil War Memorial. Maryland Gov. Martin O'Malley serve as the keynote speaker at a tribute to World War II veterans at the memorial dedicated to their service. O'Malley's father served in the Army in the Pacific during WWII. 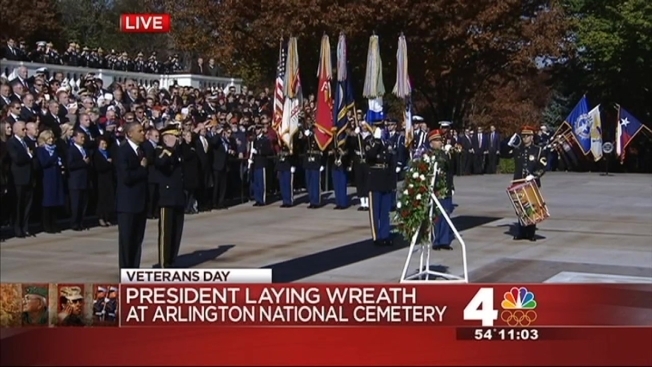 Veterans in attendance also placed wreaths at the National World War II Memorial's Freedom Wall. Surviving Medal of Honor recipients from the war attended, as the U.S. Postal Service unveiled stamps honoring them. From 8 a.m. until 5 p.m., visitors honored veterans by ringing the Freedom Bell at the cemetery's welcome center. There was also be a ringing ceremony at 1 p.m. The bell was cast with steel from the twin towers in New York City and features the emblems of each branch of the military. Also at Arlington, the last remaining survivor of a 1943 military crash landing and rescue from Nazi-controlled Albania was a featured guest at a Veterans Day weekend reunion. Harold Hayes, now 91 years old, was one of about 30 Army medics and nurses forced to crash land in Albania in November 1943. He and the others survived and were eventually rescued from behind enemy lines with help from families connected to the Albanian resistance. At the cemetery's Women in Military Service for America Memorial Saturday, Hayes and families of the crash survivors and the Albanians who came to their aid gathered for a reunion. The previously classified story is told in a recent book “The Secret Rescue” by Cate Lineberry. The Montgomery County Fire and Rescue Department is offering local servicemembers a unique opportunity on for Veterans Day. Veterans can ride along with firefighters and EMTs Monday. Participants can sign up as an observer or for a "day in the life" experience, which allows them to hop on and off fire trucks and ambulances with first responders. The experience lasts for three to six hours.